After posting my first few comments and observations about the proposed Nashville convention center I received quite a few calls. In fact, several of my more conservative friends called me and bashed my comments about the need for a new convention center. My first reaction was astonishment, but my second reaction was to research the potential effects of the convention center even further. Here is what I found out: I found that I may have underestimated our need for a convention center in Downtown Nashville. In fact, we might should consider building a center that could attract over 90% of all convention sizes instead of the 70% the plans currently service. Modeling the effects of urban convention centers in other cities, it stands to reason that Nashville can compete with the 5 largest convention cities in the United States: Chicago, New Orleans, Orlando, Las Vegas, and Atlanta. If you look at these 5 cities, each has something very unique to offer except for Atlanta. Chicago has lake front, New Orleans has the French Quarter, Orlando has Disney, and Las Vegas has casinos. Nashville has music and a lot of it. I think we can all agree that all of these cities receive an exceptional number of tourists and that a downtown convention center will only help our under performing tourism market. So what about the locations of convention centers in other cities? Well, I called quite a few residents and business leaders in the 40 largest cities and most would give their left arms in order to build a convention center right in the middle of their downtown. Let’s think about the opportunity Nashville currently has that almost no other city in the United States does. We can put a brand new, first-class convention center smack in the middle of downtown AND connect it to the Country Music Hall of Fame AND the downtown arena that hosts the NHL and many large concerts/event? How is there any question as to whether or not to build?!? Even if the construction where to cost taxpayers a small fortune (which it will not), we should still build it in order to revitalize and build our downtown into a vibrant and safe place for residents. Can’t you imagine thousands of tourists strolling the streets of downtown throwing tons of out of state cash into our economy? It’s like Christmas all year round! 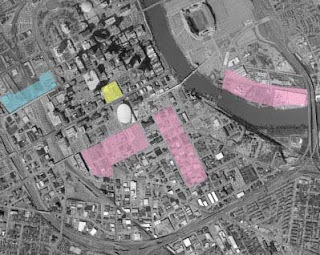 Now imagine what a downtown convention center would mean for the Nashville real estate market. Current values for condos, lofts, and homes would absolutely skyrocket as more and more retail and store space was built. There would be no limit to the heights of the downtown Nashville commercial real estate market. National retailers like Nordstroms and Saks 5th Ave would be beating down the doors of the old convention center to grab that prime space. New restaurants, grocery stores, pharmacies, doctor offices, we would have it all. We would also have a much better shot at convincing our elected leaders that we should build the baseball stadium in the Market District.